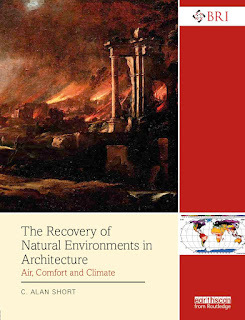 C.Alan Short (2017) 'The Recovery of Natural Environments in Architecture', Taylor and Francis, London. Five years in the making, 110,000 words and over 300 full colour illustrations, Alan Short's new book fundamentally questions the capability of the contemporary architectural idiom and its antecedents to cope with a changing climate. The recurrent forms for our principle building types were devised in the very different conditions of the mid-twentieth century and now need to be fundamentally re-invented. Prototypes for this reinvention were developing in very interesting and increasingly sophisticated ways until the introduction of ‘artificial weather’ in the late 1920s. Artificial weather released the design of buildings from the need to be responsive in any way to their external environments, impoverishing their meaning and their occupants' experience. This book exhumes these lost ideas, reinforces them with contemporary scientific insight and proposes a recovery of the lost art and science of making more naturally conditioned buildings. It is heavily illustrated with a series of innovative buildings including those designed by the author's research-based practice which have won international recognition and awards.